G's Crafts n' Things: Ohhh that yummy yarn! 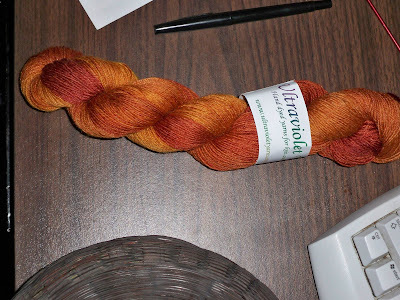 I won this wonderful yarn and my mind is whirling as to what to do with it. I was initially thinking of making a doily pattern that was a sunflower into a throw using this for the flower. but the colors are so deep and rich and my mind is into artsy mode and I'm considering using it for a crochet wall hanging of my own design one of my "make it as it goes" designs, I have this way of seeing things in my head and then trying to make them happen in thread/yarn. This would be perfect for the changing colors of leaves on a tree... or even a sunset.... hmmm the possibilities! You can find the blog of the talented lady who made this yarn at La belle Helene She defiantly as an eye for color!